Last Wednesday, while birding my lunch-hour patch along the Jordan River Parkway near Salt Lake City, I came across a banded and collared Canada Goose. I couldn't read the metal leg band from where I stood, but the neck color was certainly easy to read. 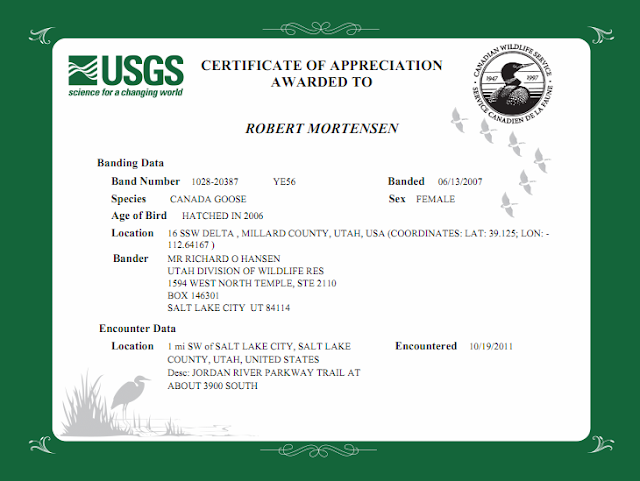 Later that day I reported my sighting to USGS and by Friday I had an email back about this goose. Turns out she's five years old and was banded not too far away here in Utah, at the Clear Lake Waterfowl Management Area. This leads me to believe she is part of a resident gaggle that probably does not migrate to the northern tundra in Spring, and likely remains in the region throughout the winter. Here is a map showing where this goose was banded relative to the location I saw it the other day. 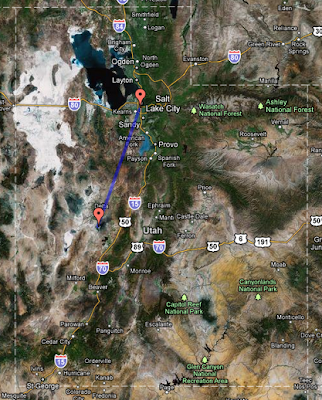 The distance is about 113 miles "as the goose flies". While I had hoped from some incredible journey to have been discovered, it is still really cool to find out a piece of history about these banded birds.